As poets, the choice of one word over another means something to Betsy and I. Walking is not rambling is not strutting is not a promenade. 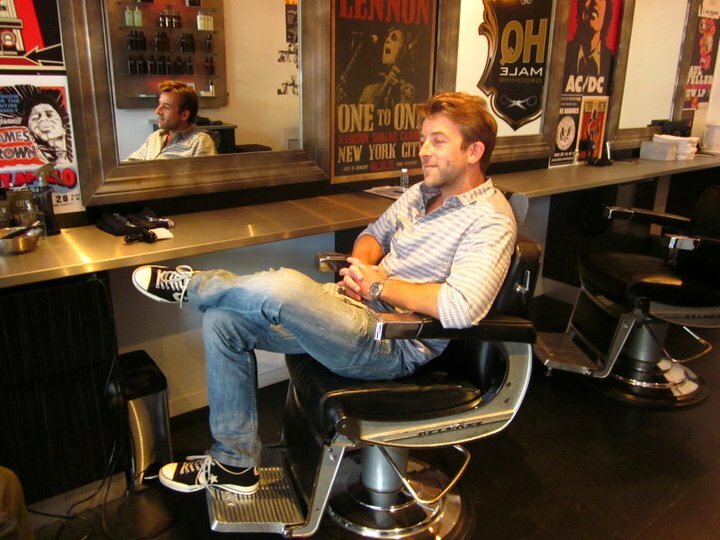 So it’s fascinating when we talk with Jon at HQ Male Grooming about what it means to be a “man”, using a series of standard questions that we have posed to several other men in our lives as a part of writing Shave and a Haircut. You see, when we asked Jon what it meant to be a “man”, he described what it meant to be a “gentleman”. The word “gentleman” derives from both French and English and previously described someone of good family, yet the word has extended to connote a man of chivalrous, courteous and honourable character; Jon uses the word in talking with us in a lovely, subtle contrast to the merely biological or social category of being “a man”. In the course of writing this work with Betsy, I’ve grown to love the idea of being a gentle man, of possessing both the traditional social (and arguably feminised) qualities of gentleness and masculinity. I want to be a gentle man too. So my ears prick up when Jon starts talking. Jon grew up in a fairly traditional, working class family in England where his “dad was the man and his mum was the mum”, even as he might not ascribe to these exact roles himself. His father was a barber before him and taught Jon the fundamentals of barbering, in the course of 40 years working from the front room of the family home as a “one-man band”. There Jon observed his father “working an 11 hour day, without even thinking about it”, passed cups of tea to his father at work and hung about the shop in the school holidays, and developing his own deep work ethic. For Jon, being a man means getting back what you put in. This is where Jon learned to be a “gentleman”, learning from his father and other older men how to treat others as you’d like to be treated, how to open a door for ladies, how to carry himself “with a bit of dignity”. Jon acknowledges that everyone has their own opinion on masculinity, that some “think it’s the Alpha Male”, and that it’s not easy to describe. Perhaps there is an element of “saying something when something needs to be said”, a way of “doing right by others”, of stepping up to “do what is asked of you to the best of your ability”. All of which builds a picture of a person who has a sense of their own ethics, a kind of stoic quality of responsibility and care, a quiet formality that belies a warmth and tenderness. In terms of advice to those wanting to be a gentleman, Jon’s words are simple – “manners don’t cost anything”. He can see the value of being polite, of being respectful. When younger people come into the store, the “polite young men really stand out” and Jon tries to encourage them to stick at what you’re doing, whether this be work, university or something else. One of the things about the festival is that in asking performers to connect with local venues, the festival asks performers to make interpersonal connections – and not every barber store was willing to have us. Some of you my know of my various tearful rants when a barber store has refused me service. So having Jon open the doors of HQ Male Grooming, a traditional barber shop with a modern twist, to Betsy and I for the Anywhere Theatre Festival, means a lot. You see, Betsy and I knew that we weren’t going to make it alone, so we’ve been interviewing the men in our lives, men we love, men we admire, men we would like to learn from – and asking them just how they became the men they are today. Rather than taking pot shots at the straw man of hyper-masculinity, we wanted to try and reconcile a more complex relationship with our own masculinities, which might even help us Taylor Mac-style “acknowledge the past, recognise the present and dream the culture forward.” The responses have been beautiful, heartbreaking, delightful, funny, searing, intimate and generous. Some themes emerge, some conceptions are turned. If you’re coming to see us on Thursday, Friday or Saturday night, spare a thought for the man behind the women behind the men – because we’re all in this together.